CMYK stands for the ink colors that printers mix to create all the shades in your digital pictures — cyan, magenta, yellow, and black (CMYK). Some printers use only CMY (no black ink). To print on a CMYK printer, you need to make sure your photo file is in a compatible format. 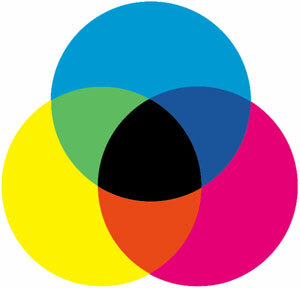 This figure shows how the three colors can mix. Cyan, magenta, and yellow ink mix to create digital photo print colors. Because inks are impure, producing a true black by mixing just cyan, magenta, and yellow is difficult. So, higher-end photo printers and commercial printing presses add black ink to the CMY mix. Don’t convert your images to CMYK for printing on your own printer if that printer works only with RGB (red, green, and blue) image data. Also, CMYK has a smaller gamut than RGB, which means you can’t reproduce with inks all the colors you can create with RGB on your computer screen. If you’re shopping for a new inkjet printer, you may see a few models described as CcMmYK or CcMmYKk printers. Those lowercase letters indicate that the printer offers a light cyan, magenta, or black ink, respectively, in addition to the traditional cyan, magenta, and black cartridges. These added inksets can expand the range of colors that the printer can produce.